If you’re looking for a color of stool chart (or a poo colour chart, for our friends outside of the U.S.), it’s probably no surprise to you that taking a second look at your bowel movement may provide valuable information regarding your health. Your stool can come in a variety of shapes and sizes, but the most ﻿telling sign of potential health risk is its color. See what your body is trying to tell you with the poop color chart from FastMed. Wheel … of … Poop Colors! Okay, so it’s a chart. We just couldn’t help ourselves. If you review the poo colour chart below, you can create a general understanding of what your bowels may be trying to tell you. Any instance you note that suggests medical attention, we strongly encourage that you seek it. This indicates a high-fat diet with little fiber. It is not a sign of any major health issues, but it should encourage you to improve your overall diet. This is the color (or colour) of normal, healthy stool. Black, tar-like stool is an indication of internal bleeding. A serious medical condition may be present, so it’s important to seek immediate medical attention. This is a common sign of food passing through the colon before the final stage of digestion. It is typically normal and not of any concern. Frequent greasy, yellow stools are often a sign of an underlying medical condition. Seek medical attention for a proper diagnosis. If your stool is dark red without any signs of blood, then the color may be due to the ingestion of certain foods and not necessarily harmful. If your stool is bright red and there are signs of blood, seek the advice of a medical professional. Typically caused by a lack of bile and requires medical attention. If you have remaining questions about your poop after reviewing our stool color chart, stop by your local FastMed Urgent Care. Our staff of experienced medical professionals is dedicated to providing the highest quality of care for all of your basic health needs. 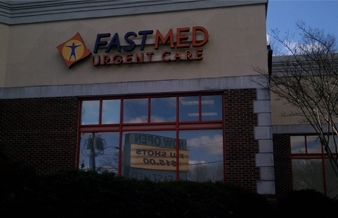 Take a look at our list of locations to find the closest FastMed Urgent Care near you!